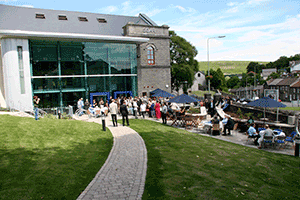 Penygraig Project is based in the beautifully restored Soar Centre, which celebrated its re-opening following it’s second refurbishment in 2006 with a multi-cultural event featuring musicians, Amampondo from Langa in Cape Town and launched by First Minister Rhodri Morgan. This Community & Family Hub, like all Valleys Kids centres, is a versatile venue which changes according to the event. In Soar during school day you will find anything from Coffee Morning, Community Bingo, Positive Parenting, and Counselling sessions . At 4:00pm all mayhem is let loose as hundreds of under 8’s appear for After-school Club. They play at: art, craft, dressing up, trikes, bikes scooters, water fights, bouncing on the bouncy castle, ball games. Food plays a big part in these sessions. Our staff ensure that there are healthy snacks and all the children have some nourishment. More joyful mayhem follows with the Middle Clubbers, who play in much the same way. Later in the evening, the Youth take over and computer games, darts, loud music, pool and table tennis are options and the bouncy castle is equally popular. The main hall, which has state-of-the-art technical equipment, hosts our own ArtWorks productions and also professional touring artists including theatre, music and dance. These enable local people to access high quality affordable art on their doorstep without the expense of travelling to Cardiff. Future Familes is based adjacent to Soar in 78 Tylacelyn Road.